I confess, I’ve always wanted it to be a hippie!!! But that’s got nothing to do with my love for Natural wine, not even with the fact to renounce to be a consumer of the society and my disagreement with the French government or even my sexual liberation, but annoyance for wine company making wine, just to make them. To taste wine without life, without curves or even worst, a wine without soul. The Domain Perraud situated in Vauxrenard (south west of Mâcon) is run by Bruno and Isabelle Perraud. Bruno is looking after the vineyard and the vinification and Isabelle after the web. I’m sure she doing also something else than to write some posts on Facebook and to write some very interesting articles on the domain's blog http://cotedelamoliere.blogspot.fr/ The domain is spread on 8,5 ha covering 4 A.O.C Beaujolais, Beaujolais Villages, Moulin à Vent and Chardonnay des Molières. Theirs Saint-Veran and Pouilly-Fuissé are made in close collaboration with a different winemaker but the bottling is done at the domain. The entire vineyard is run in organic farming since 2002.” Les Perrauds” are the sixth generation of winemaker; they took over the estate in 1988. 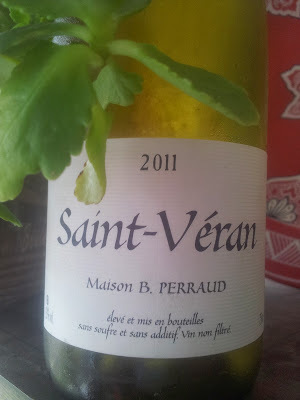 This Saint–Veran 2011 was pretty shy at the opening, cloudy but that didn’t disturb me at all. That’s happening quiet often with natural wine: I decided to leave the wine rest for 3 hour in a decanter, the nose from the barrel fermentation disappeared, to give a wonderful exotic fruit, a powerful nose, oaky but a clean with great Chardonnay character. The attack is frank, clean, a wine with a good texture, pure, on exotic and white flower note but definitely too young to give us everything. The final is pretty exceptional, when the wine comes together, a good minerality (with a bit Co2 left), clean acidity, a wine with a good tension, a wine with pulse, a wine with soul, a great Chardonnay. I have to find some older vintage to see what kind of surprise we could get! I’m looking forward to try some more wines from the “Perraud de Vauxrenard”, to feed my hipster belief to a level, where the sulfur is none. I used to be suggested this web site by means of my cousin. I am now not certain whether or not this post is written by means of him as nobody else recognize such distinct about my problem. You are incredible! Thanks!